In my whirlwind trip to Singapore, I missed many items on the checklist of must-try dishes. 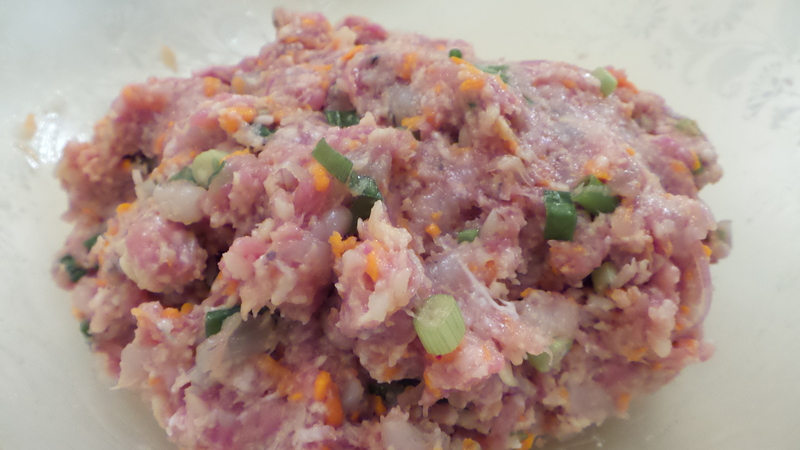 Thankfully, I was able to try some home-made Ngor Hiang from my god sister and noted the recipe. I was surprised that she did not add five spice powder to the filling! She insisted on taking the time to make mini-rolls as she says they will turn out looking nicer and taste better in small bites. This dish is a demonstration of her love, dedication, and patience for cooking. They are delicious! Prep Time: 1 hour to prepare ingredients. Wrapping time depends on size of rolls. Cook Time: Steam for 7 minutes for small rolls. 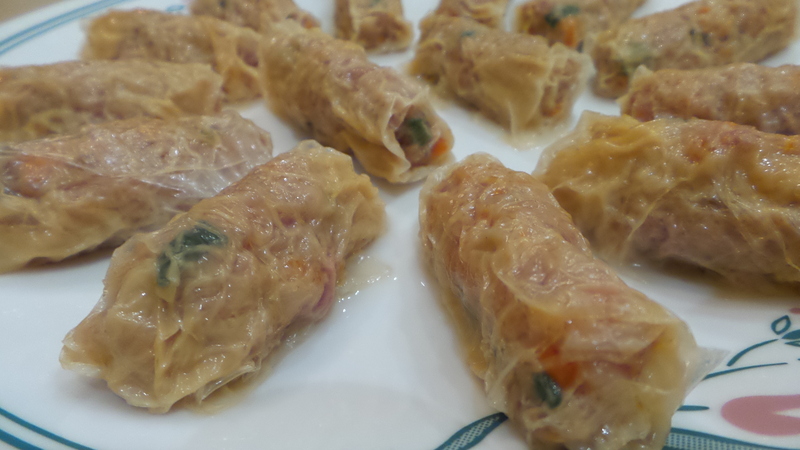 Cut beancurd sheets to desired sizes. I cut mine into 4″x5″ for small rolls. Wipe each sheet with a damp cloth. The beancurd sheets are very salty otherwise. Mix remaining ingredients in a mixing bowl except the cornstarch. Spoon filling onto each sheet, roll and seal with dab of cornstarch along the edges. Arrange the rolls on a steaming tray, do not allow the rolls to touch. Steam each tray for 7 minutes over medium high heat. 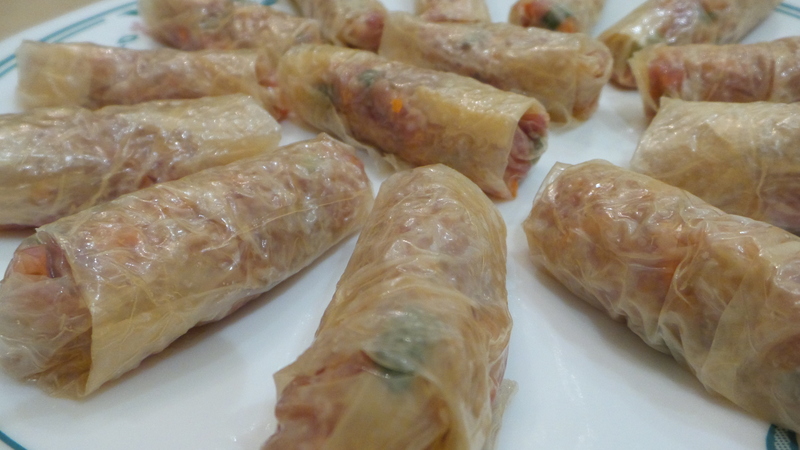 Remove rolls from steamer and allow to cool completely. Refrigerate if not eating immediately. 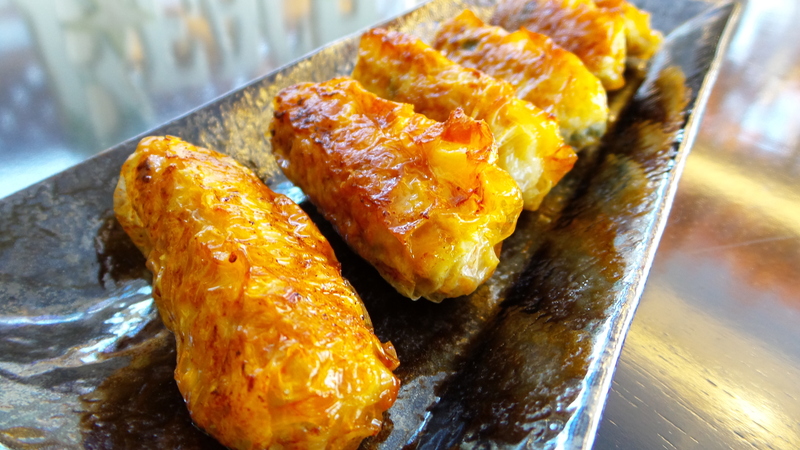 Before serving, pan fry each roll over medium high heat until skin is golden brown. Do not steam for too long as the rolls will become dry. I doubled the recipe and freeze them. 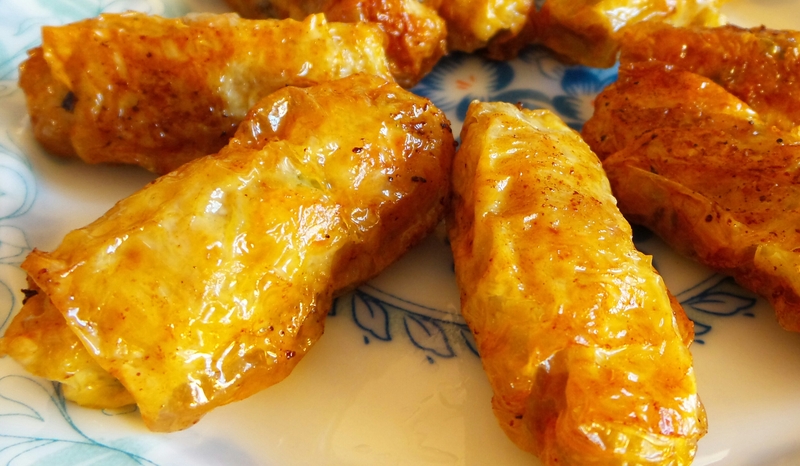 Thaw completely in the refrigerator before frying. Making large rolls will save a lot of time wrapping. Make sure the rolls are tight so that the filling does not fall out when cutting into small pieces.